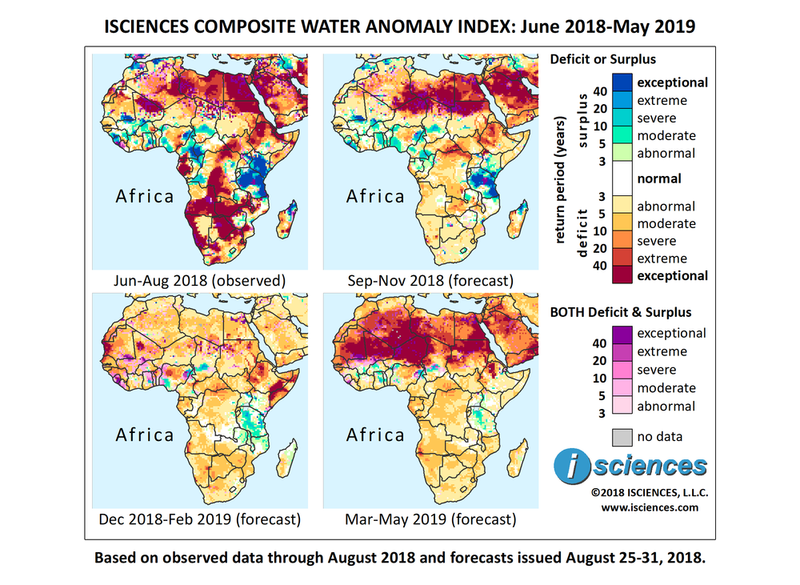 The 12-month forecast through May 2019 indicates exceptional water deficits in a vast stretch across northern Africa from northern Mali to the Red Sea. Surpluses are forecast for pockets across the southern Sahel, around the Gulf of Guinea, and in East Africa. Moderate deficits, punctuated by pockets of greater severity, are forecast for the remainder of the continent. Deficits are expected to be extreme to exceptional in western Ethiopia; the Blue Nile and the Atbara River; eastern Eritrea, Djibouti, and westernmost Somaliland; the intersection of Central African Republic, Democratic Republic of the Congo, and South Sudan; southwestern Cameroon, Equatorial Guinea, and western Gabon; southwestern Angola; southwestern Nigeria; and the Middle Orange River watershed in South Africa. Areas of surplus include: Kenya, northern Uganda, Tanzania, southeastern Mauritania, central Mali, central Burkina Faso, Ghana, Togo, western and northeastern Nigeria, south-central Chad, and southeastern Cameroon into Central African Republic. The forecast through November indicates that intense deficits will shrink somewhat in the north and will nearly disappear from the rest of the continent. However, extreme to exceptional deficits are forecast from southeastern Algeria through Egypt and northern Sudan. Deficits nearly as intense are forecast for western Ethiopia, the Atbara River, the Blue and White Nile Rivers, and the intersection of Central African Republic, Democratic Republic of the Congo (DRC), and South Sudan. Primarily moderate deficits are forecast for DRC, north-central Nigeria, coastal Gabon, western Angola, and western Zambia, though deficits may be severe on the Kafue River. Deficits are also forecast for southern Madagascar. Intense surpluses are forecast for Tanzania, southeastern Kenya, northern Madagascar, and southeastern Mauritania. Surpluses are also forecast for: northern Morocco, Algeria’s central coast, central Mali, north-central Burkina Faso, Sierra Leone, Liberia, eastern Ghana, central Togo, southern Benin, western Nigeria, northeastern Nigeria into northern Cameroon and south-central Chad, western and southeastern Cameroon, the Lukuga River in DRC, and northwestern Zambia around Lake Bangweulu. The forecast for December though January indicates moderate deficits for much of Africa with pockets of greater intensity across the southern Sahara and the Horn of Africa. Intense deficits will persist in western Ethiopia and will emerge in eastern Ethiopia and Somalia. Deficits will also emerge in West Africa and around the Gulf of Guinea, transitioning from surplus in some regions. Deficits in central Nigeria will intensify, becoming severe to extreme. Surpluses in Tanzania will downgrade, shrinking somewhat in the north but increasing in the south. The forecast for the final quarter – March through May – indicates the re-emergence of intense deficits across the vast expanse of northern Africa. Surpluses in East Africa will continue to diminish and downgrade. The largest exporter of South African apples and pears began a social media campaign to incentivize customers to stay loyal to the brand’s drought-damaged fruit, offering gift vouchers, tablet computers, and toys. The campaign follows a successful push five years ago that used the hashtag #UglyPretty to encourage customers to see the inner beauty of hail-pocked fruit. South Africa’s apple and pear production is down by over 20 percent year-on-year due to drought. The Bonkolo Dam in Queenstown, South Africa in the Eastern Cape was at less than ten percent capacity at the end of last month. As a result, Queenstown is increasingly sourcing from the Waterdown Dam, located 60 km (37 miles) away, and designed merely to augment supply from the Bonkolo. The Queenstown area has suffered severe drought conditions over the past three years. Toilets caved in at a 350-student Kenyan primary school due to flooding early this month. Classrooms, too, began cracking, causing anxiety among teachers and pupils. The school is 500 meters (1,640 feet) from the River Pekerra, which burst its banks amid heavy rain that has pelted the country in recent months. Students, especially younger students, have been advised to stay home several times since flooding began, out of concern for their health in cold wet classroom conditions. International Relief efforts recently scaled up an emergency appeal request to assist over 300,000 people affected by floods throughout the country. Little respite is forecast, and the Kenyan Meteorological Department is advising citizens to harvest rain-water, with higher-than-average rainfall expected for the “short rains” season in November through December. Over 30 people have died in flooding in Ghana caused by heavy rains and a dam overflow in nearby Burkina Faso.